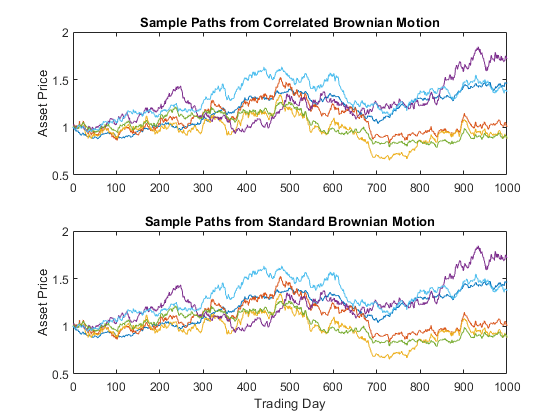 This example compares alternative implementations of a separable multivariate geometric Brownian motion process that is often referred to as a multidimensional market model. 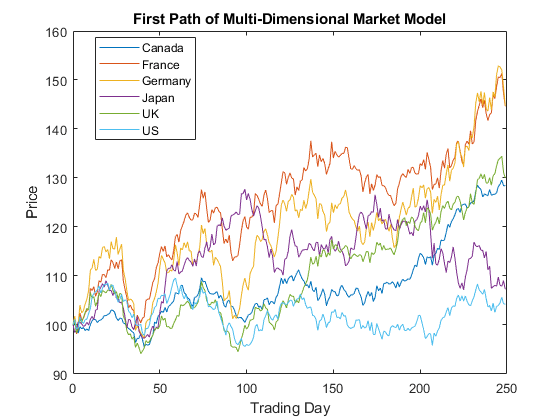 It simulates sample paths of an equity index portfolio using sde, sdeddo, sdeld, cev, and gbm objects. μ is a diagonal matrix of expected index returns. D is a diagonal matrix with Xt along the diagonal. σ is a diagonal matrix of standard deviations of index returns. 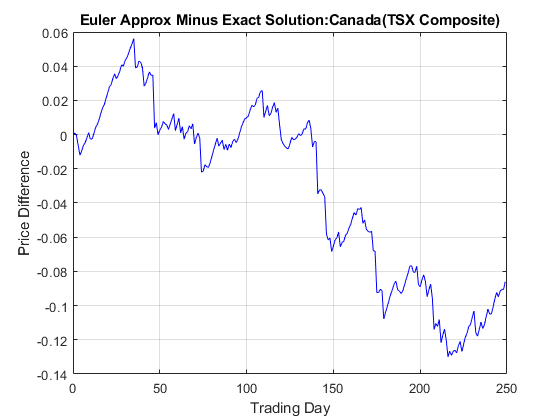 Create an sde object using sde to represent the equity market model. The sde object requires additional information to determine the dimensionality of the model, because the functions passed to thesde object are known only by their (t, Xt) interface. In other words, thesde object requires only two inputs: a drift-rate function and a diffusion-rate function, both accessible by passing the sample time and the corresponding state vector (t, Xt). In this case, this information is insufficient to determine unambiguously the dimensionality of the state vector and Brownian motion. You resolve the dimensionality by specifying an initial state vector, StartState. The SDE engine has assigned the default simulation method, simByEuler, to the Simulation parameter. The sdeddo object requires two input objects that provide more information than the two functions from step 4 of Representing Market Models Using SDE Objects. Thus, the dimensionality is more easily resolved. In fact, the initial price of each index is as a scalar (StartState = 100). This is in contrast to the sde object, which required an explicit state vector to uniquely determine the dimensionality of the problem. Once again, the class of each object is clearly identified, and parameters display like fields of a structure. In particular, the Rate parameter of drift and diffusion objects is identified as a callable function of time and state, F(t,Xt) and G(t,Xt), respectively. The additional parameters, A, B, Alpha, and Sigma, are arrays of appropriate dimension, indicating static (non-time-varying) parameters. In other words, A(t,Xt), B(t,Xt), Alpha(t,Xt), and Sigma(t,Xt) are constant functions of time and state. Create sdeld, cev, and gbm objects to represent the market model in Equation 1.
sdeld objects require you to specify A, B, Alpha, and Sigma. cev objects require you to specify Return, Alpha, and Sigma. gbm objects require you to specify only Return and Sigma. However, all three objects represent the same multidimensional market model. Also, cev and gbm objects display the underlying parameter B derived from the sdeld object as Return. This is an intuitive name commonly associated with equity models. Load the Data_GlobalIdx2 data set and use sde to specify the SDE model as in Representing Market Models Using SDE Objects. The output array S is a 250-by-6 = (NPERIODS + 1-by-nVariables-by-1) array with the same initial value, 100, for all indices. Each row of S is an observation of the state vector Xt at time t.
Simulate a single path using simByEuler. Now the output array S is an NPERIODS + 1-by-nVariables-by-nTrials time series array. The first realization of S is identical to the paths in the plot. 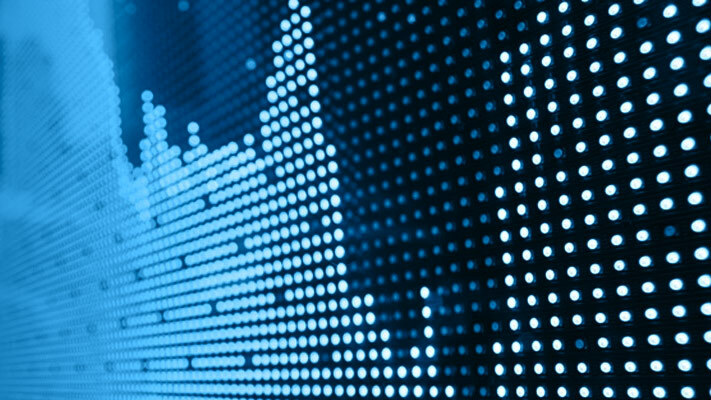 Load the Data_GlobalIdx2 data set and use sde to specify the SDE model as in Representing Market Models Using SDE Objects, and the GBM model as in Representing Market Models Using SDELD, CEV, and GBM Objects. To illustrate the performance benefit of the overloaded Euler approximation method, increase the number of trials to 10000. The output X is a much larger time series array. The discrete-time approximation improves as DeltaTime approaches zero. The Euler method is often the least accurate and most general method available. All models shipped in the simulation suite have this method. In contrast, thesimBySolution method provides a more accurate description of the underlying model. This method simulates the price paths by an approximation of the closed-form solution of separable models. Specifically, it applies a Euler approach to a transformed process, which in general is not the exact solution to this GBM model. This is because the probability distributions of the simulated and true state vectors are identical only for piecewise constant parameters. When all model parameters are piecewise constant over each observation period, the simulated process is exact for the observation times at which the state vector is sampled. Since all parameters are constants in this example,simBySolution does indeed sample the exact solution. This example illustrates two techniques that induce dependence between individual elements of a state vector. It also illustrates the interaction between Sigma and Correlation. The first technique generates correlated Gaussian variates to form a Brownian motion process with dependent components. These components are then weighted by a diagonal volatility or exposure matrix Sigma. where μ is a diagonal matrix. Here, sigma captures both the correlation and magnitude of the asset return uncertainty. In contrast to the first technique, the components of the Brownian motion are independent. Also, this technique accepts the default assignment of an identity matrix to Correlation, and is more straightforward. As discussed in Creating SDE Objects, object parameters may be evaluated as if they are MATLAB® functions accessible by a common interface. This accessibility provides the impression of dynamic behavior regardless of whether the underlying parameters are truly time-varying. Furthermore, because parameters are accessible by a common interface, seemingly simple linear constructs may in fact represent complex, nonlinear designs. In this model, the return, μ(t), and volatility, σ(t), are dynamic parameters of time alone. However, when creating a gbm object to represent the underlying model, such dynamic behavior must be accessible by the common (t, Xt) interface. This reflects the fact that GBM models (and others) are restricted parameterizations that derive from the general SDE class. As a convenience, you can specify parameters of restricted models, such as GBM models, as traditional MATLAB arrays of appropriate dimension. In this case, such arrays represent a static special case of the more general dynamic situation accessible by the (t, Xt) interface. Moreover, when you enter parameters as functions, object constructors can verify that they return arrays of correct size by evaluating them at the initial time and state. Otherwise, object constructors have no knowledge of any particular functional form. The following example illustrates a technique that includes dynamic behavior by mapping a traditional MATLAB time series array to a callable function with a (t, Xt) interface. It also compares the function with an otherwise identical model with constant parameters. Because time series arrays represent dynamic behavior that must be captured by functions accessible by the (t, Xt) interface, you need utilities to convert traditional time series arrays into callable functions of time and state. The following example shows how to do this using the conversion function ts2func (time series to function). where r(t) represents evolution of the risk-free rate of return. Compare the sample paths from two risk-neutral historical simulation approaches. 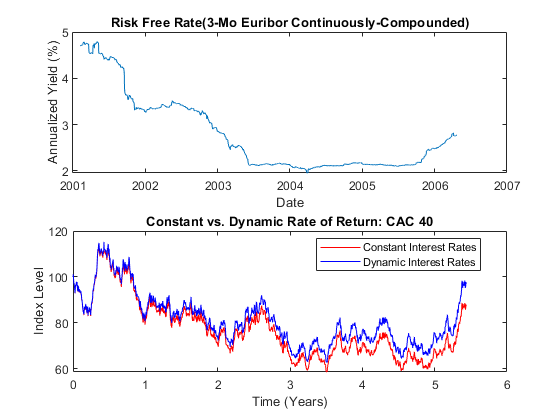 Compare the resulting sample paths obtained from two risk-neutral historical simulation approaches, where the daily Euribor yields serve as a proxy for the risk-free rate of return. The equivalence of these last two commands highlights some important features. When you specify parameters as functions, they must evaluate properly when passed a scalar, real-valued sample time (t), and an NVARS-by-1 state vector (Xt). They must also generate an array of appropriate dimensions, which in the first case is a scalar constant, and in the second case is a scalar, piecewise constant function of time alone. You are not required to use either time (t) or state (Xt). In the current example, the function evaluates properly when passed time followed by state, thereby satisfying the minimal requirements. The fact that it also evaluates correctly when passed only time simply indicates that the function does not require the state vector Xt. The important point to make is that it works when you pass it (t, Xt). Furthermore, the ts2func function performs a zero-order-hold (ZOH) piecewise constant interpolation. The notion of piecewise constant parameters is pervasive throughout the SDE architecture, and is discussed in more detail in Optimizing Accuracy: About Solution Precision and Error. The paths are close but not exact. The blue line in the last plot uses all the historical Euribor data, and illustrates a single trial of a historical simulation. to evaluate at the end of every sample time. The related example illustrates a simple, common end-of-period processing function to ensure nonnegative interest rates. This example illustrates a processing function that allows you to avoid simulation outputs altogether. The stock currently trades at 100. The stock's volatility is 50% per annum. The option strike price is 95. The option expires in three months. The risk-free rate is constant at 10% per annum. 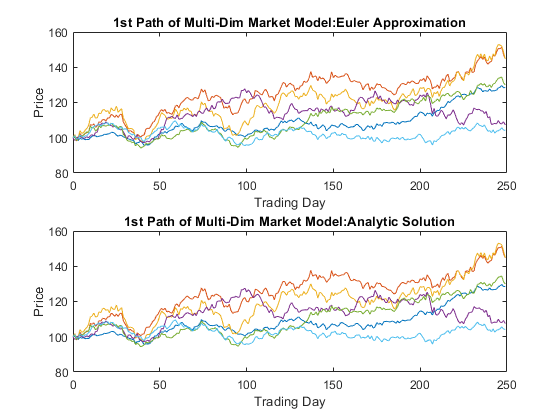 A Monte Carlo simulation that explicitly requests the simulated stock paths as an output. The output paths are then used to price the options. 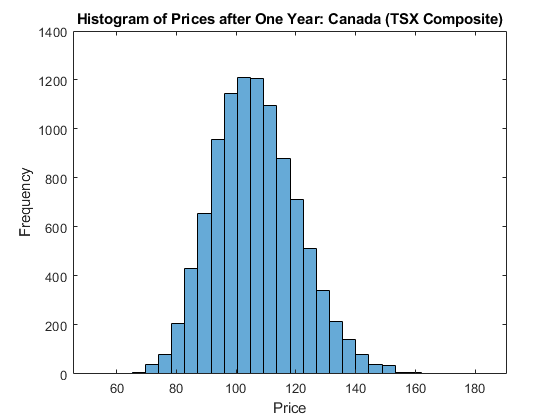 An end-of-period processing function, accessible by time and state, that records the terminal stock price of each sample path. This processing function is implemented as a nested function with access to shared information. For more information, see Example_BlackScholes.m. For reference, the theoretical call and put prices computed from the Black-Scholes option formulas are 13.6953 and 6.3497, respectively. Although steps 3 and 4 produce the same option prices, the latter approach works directly with the terminal stock prices of each sample path. Therefore, it is much more memory efficient. In this example, there is no compelling reason to request an output.